The Long Museum in Shanghai’s West Bund is usually home to collections of Modern Chinese art, but on Friday April 18 it played host to creativity of a different stripe. For the first time, Kris Van Assche reprised his Fall Winter 2014 Dior Homme fashion show in China’s coolest city, followed by a rocking after-party with 300 people swaying to hypnotic techno from Gesaffelstein. The Fashionable Truth’s Editor-in-Chief Daniel Jeffreys was on the front row. 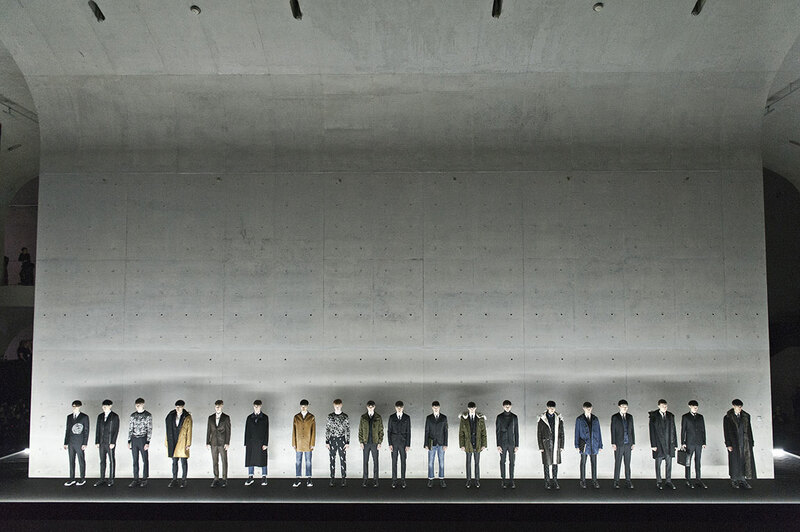 The audience at the Dior Homme FW 2014 Repeat Show was predominantly sophisticated Shanghainese fashionistos, with a smattering of Europeans, but all who marched into the Long Museum’s cavernous ark on last Friday night were treated to a brilliant display of men’s tailoring, created by a designer who has reached the pinnacle of his art. Van Assche stepped into a very challenging role when he took over from Hedi Slimane, for whom he worked as an assistant at Yves Saint Laurent (where Slimane has now returned as creative director) and Dior Homme. Slimane is credited with inventing the chopstick silhouette for Dior, which sent Karl Lagerfeld on a crash diet and brought Dior Homme millions of Asian fans. Van Assche has retained the Slimanean straight-jackets for more than 12 seasons, but with each collection he has added exceptional innovations of his own, with his latest FW collection having a decidedly Saville Row feel, which means a lot more volume, especially in coats and trousers. Alongside bold stripes, polka dots, and Mondrian-style patch-work, the spirit of the maison’s founder, Christian Dior was ever-present in the Lilies of the Valley Van Assche had placed on every seat at the museum. The flowers were also incorporated in the show’s climax as its key visual. The tiny Lilies were a personal “motif” of Christian Dior and appeared throughout the collection along with stars and coins, which were also good luck emblems for the man who changed Parisian fashion with his Bar jacket. This is a singular achievement by Van Assche, for Christian Dior never made men’s clothes (nor was he especially thin) and there was nothing in the Dior archive to guide the Belgian designer, apart from a few ties. This didn’t bother Van Assche, because he was looking for a new way to create clothes for men, one that combines elegance, wear-ability and a dash of casual insouciance. His search bore fruit in Monsieur Dior’s work for women. Van Assche’s attempt to reach an effortless and beautiful elegance for men was evident in the collection he showed at the Long Museum, where coats and jackets combined with cleverly tailored trousers all seemed to create a vision of clothes as narrative, costumes that seem to have a story to tell, with the man wearing them being the central character. In late 2010 Van Assche and I had breakfast at the Ritz in Paris. He told me then that he had already instigated a quiet evolution at Dior Homme, moving away from Slimane’s formalism. Van Assche’s approach has produced a FW 2014 collection that will make young men feel sophisticated, while more mature clients will feel sprightly and dapper. 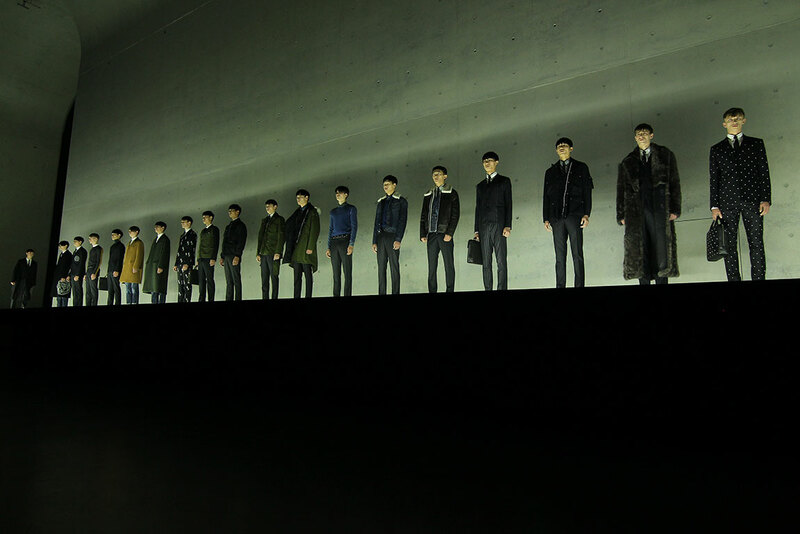 Last year, the Dior Homme collection was presented in Beijing for its first-ever show outside of Paris. 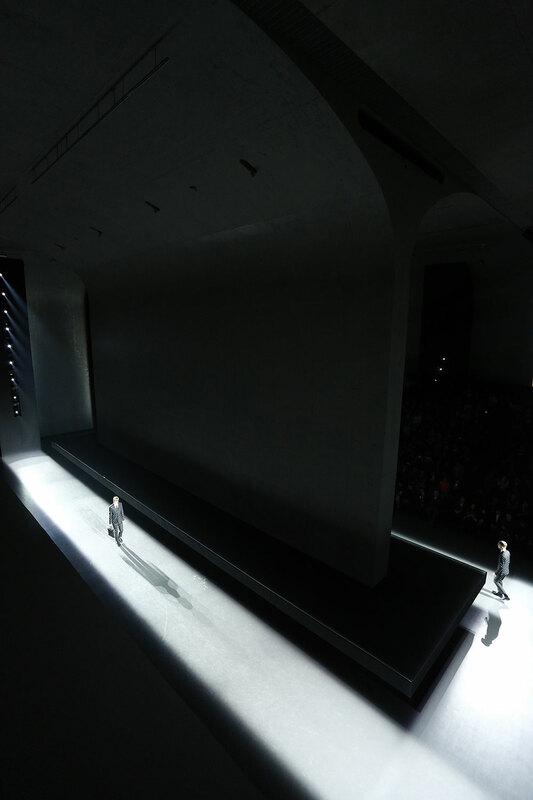 This year it was Shanghai’s turn, underlying the role that the city now occupies as China’s fashion and design capital. And that message felt right on target as we filed into the Long Museum’s basement, to watch Gesafflestein pilot his spaceship of sound into the starry night. With a glass of champagne in hand and petite lilies in my buttonhole, I felt ready for any challenge the galaxy might have in store.